On Tuesday, Epson introduced four new members to its Stylus NX series of consumer all-in-one printers. 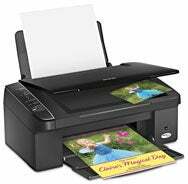 The Epson Stylus NX115 (estimated street price of $70) prints up to 30 pages per minutes in black and white; the NX215 ($90) includes a 1.5-inch LCD screen and card slots, supports borderless photo printing, and prints up to 32 pages per minutes in black and white; the NX415 ($100) includes a 2.5-inch tilt LCD screen and card slots, redeye removal, and prints up to 34 pages per minutes in black and white; and the NX515 ($150) has Wi-Fi and Ethernet built in and prints up to 36 pages per minutes (15 pages per minute with "laser quality") in black and white. Epson does note that some applications or functions, such as two-sided printing, may not be supported on the Mac. All four models use Epson's smudge-, fade- and water-resistant with Durabrite Ultra all-pigment inks and MicroPiezo print technology with individual ink cartridges. All models works with OS X 10.3.9, 10.4.11, and 10.5.x, and will be available in June.